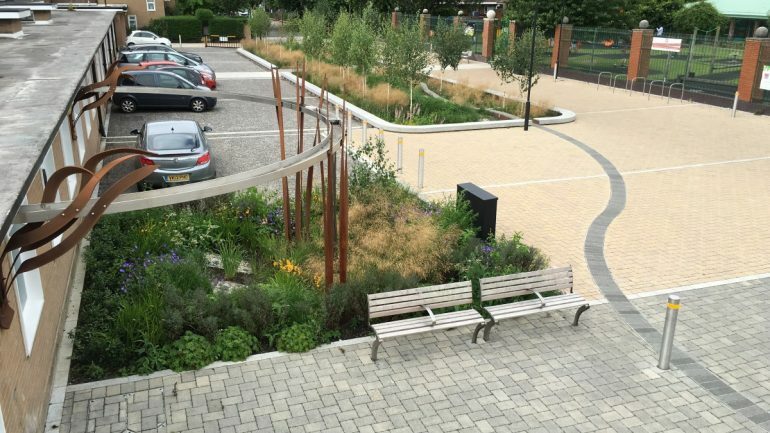 The trade association Interpave explores an exemplary, award-winning urban regeneration and sustainable drainage (SuDS) scheme, featuring innovative applications of concrete block permeable paving. Bridget Joyce Square in Australia Road, White City, London, is a SuDS park with community at its heart. Its design, by SuDS consultants and landscape architects Robert Bray Associates, introduces the innovative concept of concrete block permeable paving as a thin overlay for existing streets, removing rainwater straight from the surface without gulleys and providing some attenuation and treatment before discharging to adjacent, well-planted basins. 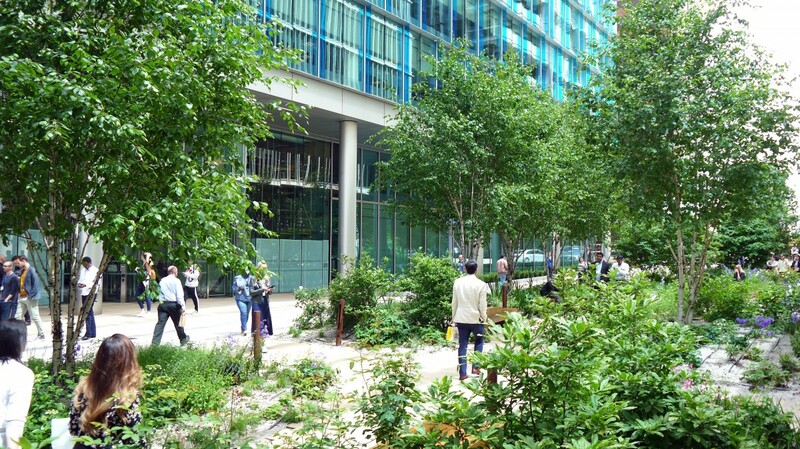 The scheme won ‘Winner of Winners’ (the President’s Award) as well as Winner of the ‘Adding Value through Landscape’ category at the 2017 Landscape Institute Awards, and also an ICE London Civil Engineering Award in 2016. But most importantly, it has been enthusiastically welcomed by local residents, as recognised by a Sustrans community survey. In 2013, the head teacher of Randolph Beresford School and the White City Residents’ Association approached the London Borough of Hammersmith & Fulham. They recognised that the road in front of the school was unsafe and unhealthy, and identified the need for a public meeting space where events could be held. Coincidentally, the Borough was looking for a landmark retrofit SuDS project at that time. The scheme also connected the Randolph Beresford Early Years Centre to an adjacent play area and generated a social hub for parents and children. Local residents were keen to retain memories of the low wall in front of the school, used as a balance beam in their youth. From this the thematic ‘Wiggly Wall’ was born and became part of a ‘ribbon’ motif that united the linear spaces and symbolised the bringing together of the community. bringing water into planted raingardens. Some roof water, together with car park runoff, flows along sett channels and through stainless steel letterboxes into planted basins. Finally, two flow control chambers on outlets from the basins protect the combined sewer. Thus, rainfall remains within the SuDS landscape until storms have passed and the sewer can deal with water again. A case study exploring this project has recently been published by Interpave, available from its website: www.paving.org.uk. Interpave’s new website provides an essential resource covering all aspects of design with precast concrete paving, including permeable paving for SuDS. It features an inspirational project gallery and case studies, supported by background information for early design stages, as well as for CPD. A comprehensive series of technical documents covering all types of precast concrete paving products provide the definitive source of guidance for designers and contractors – including detailing, construction and maintenance.